In fall 2018, DELTA’s Planning and Assessment team initiated the NC State Learning Technologies: All Faculty Survey (AFS)—an evaluation of NC State’s current instructional technology environment. The AFS was guided by DELTA’s commitment to build awareness of its services by seeking input from faculty. The findings provide opportunities to consider how well NC State’s enterprise learning technologies are meeting the instructional needs of full- and part-time faculty teaching for-credit courses. Further, instructors’ input helps pinpoint instructional technology adoption and use, identify ways to expand training and support, and continue to identify needed services to ease the impact of technology adoption, upgrades, and use on their time. Knowing who participated in the survey establishes a context for understanding the findings summarized in this article. In fact, we were able to learn the most from faculty teaching face-to-face courses. A random stratified sample of 600 instructors from all colleges teaching in the traditional, blended, and online modalities were invited to complete the survey. A majority (almost 90%) of the 116 instructors who participated were teaching face-to-face courses, less than half (41%) said they were teaching online, and close to one-third (29.31%) were teaching using a blended format. A key takeaway from the survey is an understanding that not all faculty at NC State know about DELTA and its mission as a service-oriented unit supporting faculty teaching with technology and/or were not aware of similar services that are available for them For example, many survey respondents were not aware that course captioning funds are available via OIT to assist with creating accessible multimedia; a few were not aware of available DELTA workshops; and others were not aware of the enterprise Lynda.com license(s) that are offered free of charge via the NC State University Libraries. These findings point to the need to review with faculty DELTA’s services and support of teaching and learning with technology. As such, DELTA is reviewing its marketing and communication efforts in an effort to determine where there are gaps in disseminating information in order to increase awareness of DELTA and its resources to more faculty. DELTA uses a variety of channels to communicate information to instructors about its services. We learned that instead of using social media platforms (e.g. Twitter, Facebook, LinkedIn, etc.) faculty may prefer we communicate using the tried-and-true email and DELTA website for information about technology training and support. WolfWare notifications, colleagues, and OIT’s SysNews are their primary resources for getting timely, clear, and accurate information about NC State’s enterprise learning technology maintenance, outages, and/or upgrades. Instructors’ average ratings of DELTA’s communication with them on instructional technology maintenance, outages and/or upgrades with respect to timeliness, clarity, and accuracy were notably high. The university’s policies, regulations and rules (REG 08.00.11) establishes that when instructors are teaching in an online environment or using online resources in support of teaching blended or face-to-face courses, the course home page must be internally hosted. This is (most likely) why close to 95% of survey respondents used Moodle for teaching part or all of their courses. Based on respondents’ feedback, NC State’s learning technologies are meeting the instructional needs of most faculty. Overall, instructors were satisfied with and comfortable using Moodle, Mediasite, online collaboration tools (e.g., Google), and an online communication tool (e.g., Blackboard or Zoom). Still, there are improvements to be made. Some respondents suggested Moodle can be improved by adding more robust analytics capabilities, having better integration with Google apps, and by revising its gradebook. A few others indicated that recording lectures in a convenient location and easier to use classroom capture technology would improve the use of Mediasite. Mobile apps and more reliable online communication tools (e.g., not dropping meeting attendees) would enhance online synchronous class meetings. DELTA is already responding to these recommendations. For example, upgrading Moodle integration with Google apps is underway. WolfWare Google Groups was recently added to our WolfWare suite. The goal is to offer faculty the benefits of the soon-to-be-retired WolfWare Email List functionality with the additional flexibility offered through Google Groups (such as simplifying access for Google Calendar and Google Drive sharing). The online conferencing software, Zoom, is now an enterprise-level tool available in the WolfWare suite of tools to support instructional needs related to synchronous communication and collaboration. Faculty and students can use it for more reliable video, audio, chat functionality, and take advantage of its engagement tools and features. As a way to consider expanding the tools and services offered, DELTA asked instructors what they would like to do using currently supported learning technologies. Checking for plagiarism was the top choice for respondents (45 of 93), followed by integrating collaborative writing tools, and adding interactive video (e.g., pause and ask a question, embedded questions). The university purchased a license for Turnitin to help ensure the integrity of student work. The report Turnitin produces will detect if there are similar areas of texts in published documents to the submitted assignments; however, it does not check for plagiarism in a piece of student work as survey respondents requested. DELTA is currently researching interactive video technology, such as PlayPosit, for giving faculty the ability to enrich self-paced learning via exploration, analysis, and application of concepts through enhanced active learning. Teaching with technology workshops, instructional consultations, course development support and facilitated teaching and learning environments are integral to the growth of DE courses and programs and learning technology adoption across many traditional and blended courses. To determine if faculty needs are being met, we asked specific questions about the impact DELTA’s training and support services has on faculty’s adoption and use of learning technologies in their courses. Similar to what we’ve found in past DE faculty evaluations of our DE services, DELTA’s training and support staff received many compliments regarding their efforts. “DELTA is truly a lifesaver. My courses are better because of the training I have received through 1:1 [consultations] and workshops,” wrote one instructor. DELTA is paying particular attention to the mode in which faculty would prefer to attend training based on the proportion of faculty who favor on-campus, in-person workshops (62%), online asynchronous (e.g., video recording) learning (52%), blended workshops (some online and some in-person) (38%), and online synchronous (e.g., webinar format) (28%). And in one or more of these modes, respondents indicated they would like DELTA to offer workshops on how to integrate media components (e.g., video, animation, VR 360°) and learning activities into their courses. They also want added training and tips on strategies for course management, teamwork/group work, engaging students, and teaching best practices. In early summer 2018, NC State activated a Lynda.com site license, which provides faculty and students access to online training and tutorial resources (e.g., business skills, human resources, data analysis, software skills). Using the survey findings, DELTA is able to consider instructors’ awareness of these resources. We learned that a small proportion of instructors (18% of 108 respondents) used these tools to support teaching, and even fewer instructors referred their students to these resources. We also discovered that 41% of participants surveyed were not yet aware of the license(s) at NC State, and another 31% said “yes,” they were aware but did not point students to these tools. From the list of training and tutorial topics available, two out of three survey respondents showed the most interest in data analysis and software skills. In response to these findings, DELTA is planning for improved communication about the online tutorials. In addition, DELTA is adding training opportunities for faculty to learn more about how they and their students can utilize Lynda.com’s online training and tutorials, as an example, to supplement teaching and learning in a multitude of courses. DELTA began collaborating with University Courses and Curricula Committee, NC State Registration and Records, Student Senate representatives, the Vice Provost for Faculty Affairs, and the Graduate School to explore the expanded availability of DE course detail page technology so students can make optimal course selections for their plan of study and in support of progress toward the degree (DELTA Strategic Plan, 2017). The online Syllabus Tool is available to help instructors easily create a standard NC State syllabus for their course(s). With the goal of informing the continued development of the online syllabus tool (accessed via WolfWare), we sought to determine faculty interest in making high-level course information available to students prior to registration. Survey participants were asked if they used the online Syllabus Tool, and if “yes,” which elements of the syllabus tool they think should not be available publicly prior to course registration (e.g., for new students without UnityIDs as well as students not yet enrolled). In descending order (from 34 to 21% of respondents), respondents indicated they would not share late assignment policies, grading policies, instructor and TA information, or the course schedule with students prior to their enrollment in a course. Forty-two percent of those who answered the question (22 of 53) said they would use the online tool for sharing all elements of the syllabus. One section of the survey targeted a sample of NC State’s DE faculty. Consistent with findings from past DE surveys, these respondents indicated that DELTA DE Services continued to deliver excellent support. Exceptional assistance was provided for addressing academic integrity, scheduling exams, and DELTA’s communication with the instructors and their students. Of the 47 DE faculty who participated in the survey, 16 said that the lack of in-person interaction was a barrier to teaching online; 8 do not have time to develop or teach DE courses; and 7 indicated there is a lack of additional compensation for their efforts. 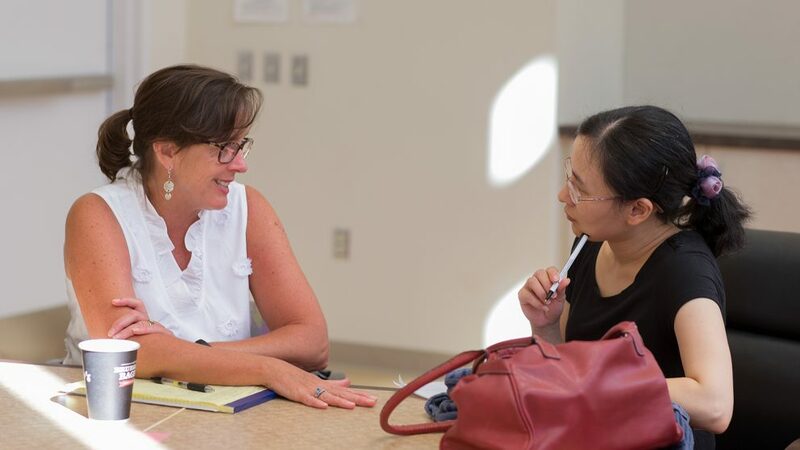 Survey participants who taught online were also asked to indicate their interest in the Online Course Improvement Program (OCIP), which is a DELTA-funded professional development opportunity for faculty who are in pursuit of improving their online course(s). The program includes a cohort of faculty peers and DELTA staff working together to meet the nationally recognized standards of the Quality Matters™ (QM) organization. Fourteen survey respondents were interested in participating in OCIP and an additional 11 expressed interest but wanted more information. These instructors would be willing to commit 1 to 3 hours per week to improve their course(s). When asked which incentives would be appealing for participating in the program, respondents selected instructional design support, a stipend, instructional technology training, and/or official recognition from QM— which is all provided in OCIP. DELTA Testing Services are available to faculty teaching students enrolled in DE courses, faculty in the College of Sciences who are teaching face-to-face and DE courses, and for those students who have registered for Disability Resource Office (DRO) accommodations. More than two-thirds of survey respondents said DELTA Testing Services staff provided excellent help addressing academic integrity issues, scheduling exams, and communicating with the instructors and their students. DELTA will continue to monitor DE proctoring capabilities to ensure the need for adequate facilities (and availability of those facilities) is met and faculty and students continue to receive excellent support. While not covered extensively by this survey, DELTA anticipates future increases in DE instructors’ reliance on its testing services. This is based on a number of data points, which include increasing usage of the centers. Understanding instructors’ knowledge and use of this service is helpful for planning for future expansion of on-campus testing facilities. The survey findings suggest opportunities for DELTA to better understand how well NC State’s enterprise learning technologies are meeting the instructional needs of full- and part-time faculty teaching for-credit courses. Staying attuned to instructional needs will be essential for DELTA to continue pinpointing possible trends in instructional technology adoption and use, identifying ways to expand training and support, being mindful of cultural shifts, and continuing to determine needed services to ease the impact that technology adoption and use may have on professors’ time.